In loving memory of the 340th birthday of Sikhism's Tenth Guru, Guru Gobind Singh Ji (1666-1708). Painting of Guru Gobind Singh with son Baba Jhujhar Singh. "I came into the world charged with the duty to uphold the right in every place, to destroy sin and evil... the only reason I took birth was to see that righteousness may flourish, that good may live, and tyrants be torn out by their roots." 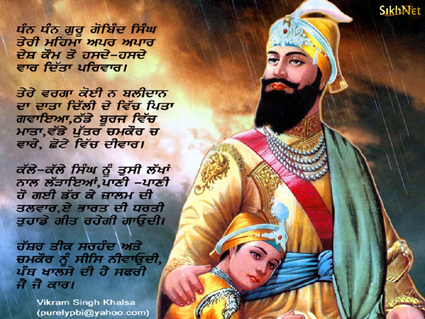 - Guru Gobind Singh Ji. Simply put, Guru Gobind Singh is The Man. A happy Gurpurab to all on this most auspicious day. Hi there, Just wanted to say, I really honestly love the effort you have put into protraying the Sikh identity to the US, and also to the world, Thank you and your team, and best wishes for the future, Waheguru Ji Ka Khalsa, Waheguru Ji Ki Fateh! Thanks for your thoughts Gaganraj. We hope that 2007 will be a good year for us.